This weekend we went out to a coworker’s house for brunch, which was very nice and I got to meet their super-sweet kids. It was fun to run after a super energetic toddler and have the simplest things make him laugh. 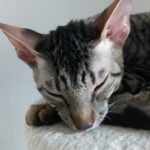 And they have Cornish Rex cats!! 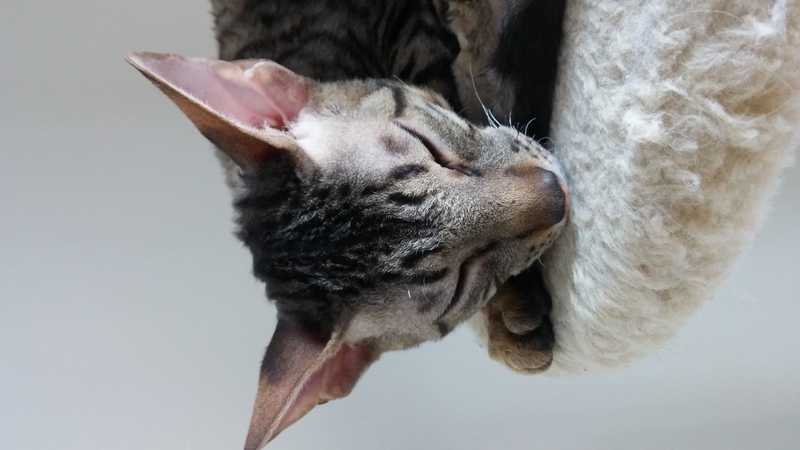 I took so many photos of their furry friends….the Rex cats look like little princes and are super soft. That took most of Saturday and the rest of the weekend was taken up with movies and crochet. I find crochet so comforting and meditative. There is also something very tribal about having soft yarn rubbing up against your fingers and being made into something useful. I had a lot of time to think while I did my crochet project this weekend. I found myself wondering why I am always so busy and accomplish so little. Why I do so much but feel like something is missing. Why do I feel so unsettled and rushed all of the time? I think I need to prioritize better. I do spend a lot of time organizing and reorganizing my house and my desk, but instead of decluttering lately, all I have been doing is shifting stuff around. That is also called procrastination…at its finest. I wish that was a marketable skill! Ha! I also spend a lot of time on social media, but I find that mostly restorative. I always joke I would be a happy shut-in, I get so awkward feeling in social situations (I’m always the one having a convo with a baby or cuddling the pet to avoid real interactions), but even I need social interaction. Even on days when I don’t feel like talking, I still interact with people on a daily basis through social media. You have to be savvy on what you tap into on a given day: it can lift you up as much as it tears you down, but I read a really good article on why introverts love the internet and social media so much, and I related to it 100%. I know I need to cut down on the busy work, the aimless reorganizing, and the social media interactions to make space in my day but what else? I also need to pare down my life so that I have more time. I need less stuff to take care of, to learn how to say no, and what I really, really, really want to happen in my day. I also need to look my dreams square in the face and say, “I’m coming for you!”, rather than fearing success (or failure) and running away like I always have. Maybe most importantly, I need to figure out my must-haves in my five year plan and as focused on that plan as I am flexible. I need to spend a week meditating on what I want versus what I need versus what I thought I wanted. This last point is very important. I have always been very inflexible once I have planned something. It can start to drain all my life energy and I can recognize it is making me cranky and insane to live with but I keep going, even though my plan is doing the opposite of what I expected. I shackle myself to a plan and drag it like a dead body to the finish line. I need to evaluate more often and think of why I wanted it in the first place and if it is worth it in the long run. You know, listening to my gut instinct, as it were. I also need to accept that making myself happy and getting ahead financially can be synonymous and I don’t need to feel guilty about that. I could give myself more credit sometimes for my natural talents and take pride in them. I am very bad at that since I grew up with the idea that happiness and pride are only for people with big egos. That idea can be shifted! I also need to look my dreams square in the face and say, “I’m coming for you!”, rather than fearing success (or failure) and running away like I always have. 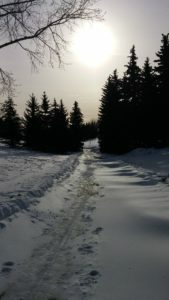 As I walked today, I had some thoughts on how I could shift my life around so that I don’t feel crazed b usy and unhappy. Why I was out walking had a big deal to do with my thought process. Over the weekend, someone had once again commented on my crochet hats and said his girlfriend would love one. Now, in the past, I would make a nice thank you comment and move on. It never occurred to me to step up and offer to make a hat for a person I don’t know and get paid for it. 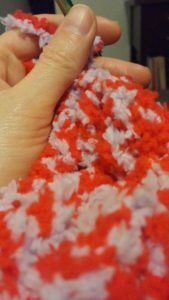 If I did think about it, I would brush it off, thinking my crochet ability wasn’t good enough and that I would get only negative feedback- Or that making money that way seemed too obvious for me. Something I enjoyed, that I do anyway, and that I am fairly good at?? Pffft……let’s explore this idea over here on marketing that I would hate but seems more “job-like” and “official”. It’s funny how we can take things and complicate them for ourselves! Maybe that is why my grandma waited until her sixties to sell her crochet work! This time I took the plunge and sold an item, with my Mom cheering me on over text. I sold my first crochet piece ever!! I took a pattern and modified it slightly and sold it. I am scared and nervous and extremely excited. I am going to hold on to that last feeling. The buyer doesn’t have it yet so don’t know her reaction. Cross your fingers for me. So, while I walked, I thought, “Why not? !” a LOT. Why not be my own cheerleader? Why not jump into selling the items I love to crochet on Etsy? Why not making more time for my own pursuits? Why not keep babbling online on my blog?? Why not tie it all my pursuits together and talk more about my passion for crafts on the blog? Why can’t I?? I haven’t started my Etsy shop yet, or made money through my blog, but I enjoy both ideas so much it is still a win for me. Today I walked for 40 mins and told fear to go “Eff” itself. Everything in this life is worth a try if you love the idea enough! I hope this feeling lasts. I have little bursts of confidence like that and feel like I could run the world. The trick (at least for me) is to keep persisting through the days when I feel fearful and negative. Have you started an Etsy shop? Tips for me? Do you crochet and love it? Share your favourite thing to make below!